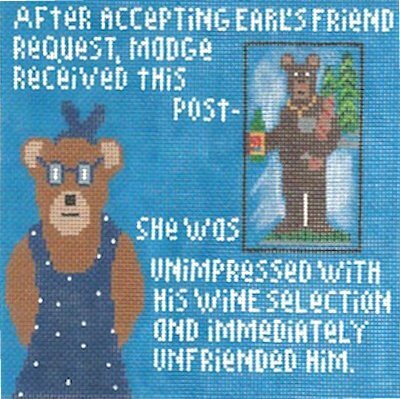 A Madge series needlepoint canvas from Cooper Oaks LR8001-4 with a reference to Facebook. In this handpainted canvas the ever-discerning Madge is unimpressed with Earl as a dating option when his wine fails to measure up. The design measures 8.5" x 8.5" on 13 mesh. Use the drop down menu to make your thread choice or to select canvas-only. For cotton we send DMC floss; wool and silks are from Planet Earth. If you require stretcher bars to hold the canvas taut while you stitch it then we recommend two pair of 12" and some thumb tacks. This Madge series canvas is suitable for a novice stitcher who has perhaps completed a basic project already; and of course anyone with more needlepoint experience would love the color changes, stitch selection opportunities, and whimsical nature of this fun and contemporary needlepoint design. Shipping is free within the US for all orders of $ 100 or more. Contact us with any questions as we're always glad to help and we try to respond within a few hours. Helenz Bag 13" x 10"